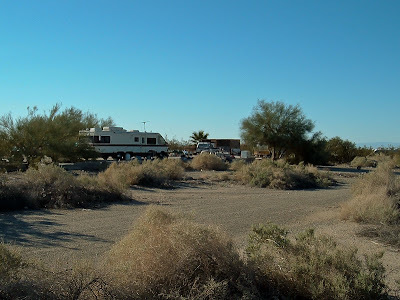 Monday we drove down around the east side of the Salton Sea and arrived in Niland, Ca turning down a dirt road towards Slab City. 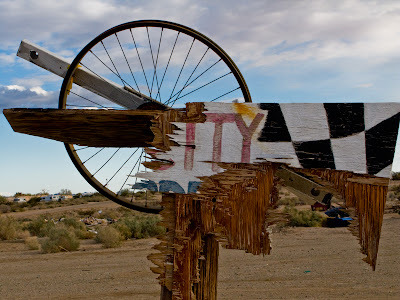 Slab City is a former military base used during World War II, is still owned by the government, and all that remains of the buildings are concrete slabs. A community has formed here made up of...... sorry words fail me here. As we drove closer we could see Salvation Mountain looming in the distance. 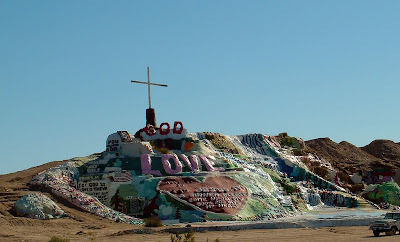 Leonard Knight arrived here in the 1980's and felt led to construct Salvation Mountain. It is built from clay, straw, tires and lots of colorful paint. 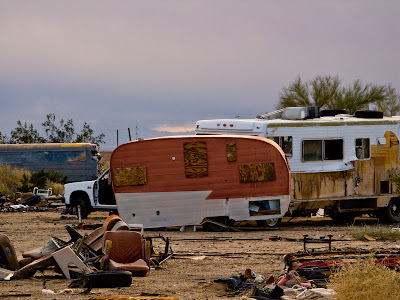 Slab City is isolated, with wide open spaces and FREE. 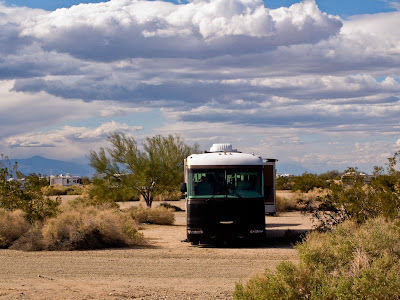 You simply find a spot that you like and claim it.We drove into the 'City', past much trash and less than desirable structures. We found an area we liked and parked for the night. 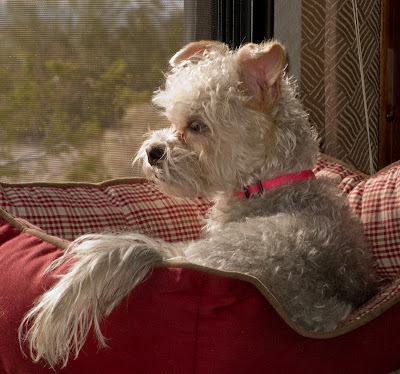 Mollie prefers grass and never adjusted to Slab City desert dirt. I guess she didn't like being watched by all the neighborhood dogs roaming free and all the strange smells. As darkness approached and stars apeared Mollie decided she needed yet another walk. 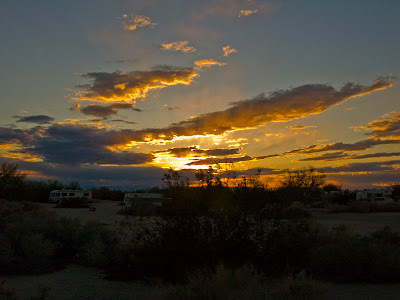 As I stood outside with her admiring the stars listening to the strains of electric guitars.... yes guitars, remember this is Slab City, I realized what a strange place this was. 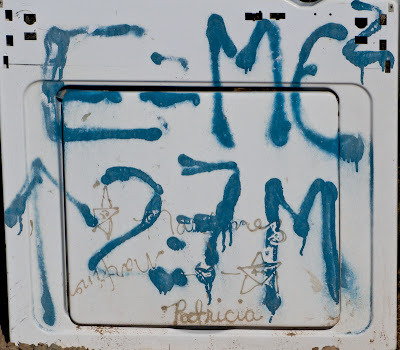 With military and border patrol vehicles driving by morning and evening, we did not find this a particularly peaceful place. I guess you have to be here a while to understand the real ambiance of this desert hangout. Maybe some day we'll give it another try, but for now it's time to move on. 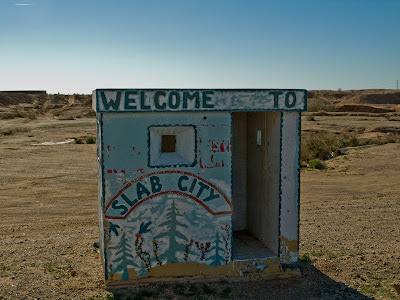 I don't remember of you saw the film "Into the Wild" which featured Slab City.